Back when I was a youngster, nostalgia was reserved for the elderly. ‘Things were nicer in the old days’ were phrases that pensioners would stereotypically use whilst munching on spam sandwiches and guzzling whatever people guzzled during rationing. However, today nostalgia can apply to media from as little as 20 years ago. In fact, I feel rather depressed that legendary Nintendo 64 launch game Mario 64 was released two decades prior. It may baffle gamers these days as to why Mario 64 was such a big deal, but at the time, it was the only game to have truly mastered a platform game in a three dimensional game-space. Platformers were the go-to game of the 16-bit era. But with the advent of polygonal graphics, it became fashionable to use them when the 32-bit era came along. Many people had attempted to make 3D platformers, but few were commercially successful and even less critically, and in turn, platform games became a niche genre instead of the FPS of the 16-bit era. Then Mario 64 turned up and showed the world that the 3D platformer wasn’t only possible, it could be good, too (even if it required its own controller!). Recently there’s been few retro style games, trying to recreate the feeling of those games of old. You’re most likely aware of Yooka-Laylee and Mighty No.9, but there’s also been Tinker: City of Colours and Oceanhorn: Monster of Uncharted Seas amongst others. From the off, it’s immediately obvious that Pi has been made with a lot of love. It focuses on the N64 era of gaming and while it instantly feels like Mario 64, it’s impossible to ignore the influences of other Nintendo games like Zelda. The gameplay takes after the aforementioned Mario 64 – each level is an open course. At the start of the level you can choose (or are given) a medallion to collect to end the level or you can select to go for particular medallions, which are located in different parts of the course and have different methods to collect them. This medallion screen is also so, so similar to the star select screen from Mario 64. Alongside each course, there are challenges which are essentially minigames and are time-based, speedrunning affairs. These are a nice addition, but a little too short to add much to the game unless you’re really into your speedrunning as there’s a leaderboard which shows you other players’ times, giving you something to aim for. There’s some nice variation in the challenges, though: jumping over an abyss onto moving platforms, navigating your way across a continually moving tower and sliding down a slide with no sides and a huge drop to your doom. Another downside is that while each course is well designed and looks very pretty, there’s only five in the game at this stage, hopefully we’ll see some updates which pads the game out somewhat. Poi’s main character is sometimes difficult to move around due to a mix of his speed and an occasionally iffy camera. The character designs are nice, but a little forgettable – you can switch in-between a boy and a girl, both dressed in kiddie-style adventuring garb. The designs are nice, but not particularly iconic or anything; not that I was expecting them to be. In terms of looks and design, Poi is undeniably cute; again there’s the Nintendo 64 based charm. Poi’s graphics are bright, bold and beautiful, I’m using a slightly older laptop, but I find that the graphics even on the highest settings run smoothly. On lower settings, the graphics do look nice, but when set to very high they look smooth and atmospheric. The music is nice, if a little standard – it’s kind of what I expect of a platform game, pleasant and cheerful. The game does appear polished, though I had read that some people had suffered from bugs in the game, but I can honestly say I didn’t come across any personally. Poi has jumping mechanics that have appeared in a number of platform games. Mario’s triple jump is there, as well as double jumps, wall rebound jumps and the ability to grab onto the edge of ledges, which is something that even the great Mario 64 didn’t have. The player-character isn’t as smooth as Mario, however. There’s something about the 360 degree movement that Mario 64 had that made him feel fully open in his movement, which Poi doesn’t quite have. Jumping onto tightropes is difficult at times and when using spring jumps, control can be a little difficult. I’d also recommend using a controller for Poi as, although the game can be played with the keyboard, the game really does feel built toward controllers. 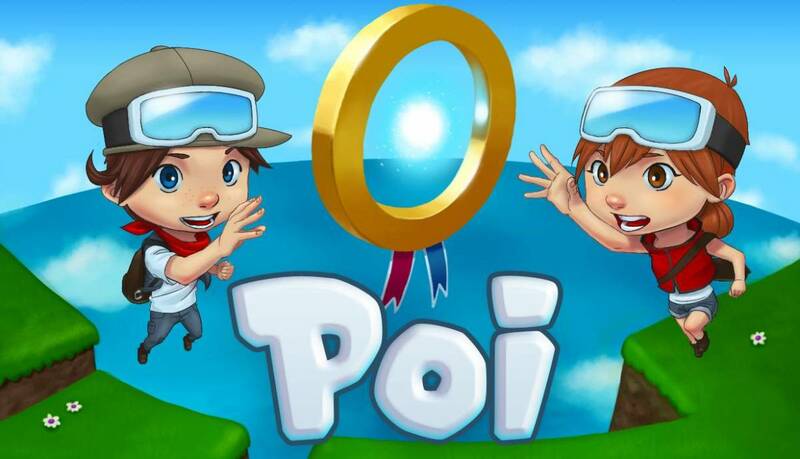 Poi is a fantastic platform game filled with nostalgia. While it mainly emulates Mario 64, it aims to emulate general platforming games from the late 90’s. Fans of these games will enjoy Poi, but some younger gamers might not enjoy the experience so much. That being said, Poi is well made and is obviously a labour of love. Despite it being short in length, Poi is well worth its price of £10.99, although I do hope they add more content to the game over time. Poi is a wonderful flashback to early 3D platformers and while it succeeds with the feel of the genre, a lack of content holds it back from being great.